In 2013 the city of Detroit filed for bankruptcy. Abandoned buildings, broken streetlights and vacant lots were all too familiar sights to residents and visitors. What would happen next? What would Detroit look like in the future? Here we are 4 years later, let’s take a look. 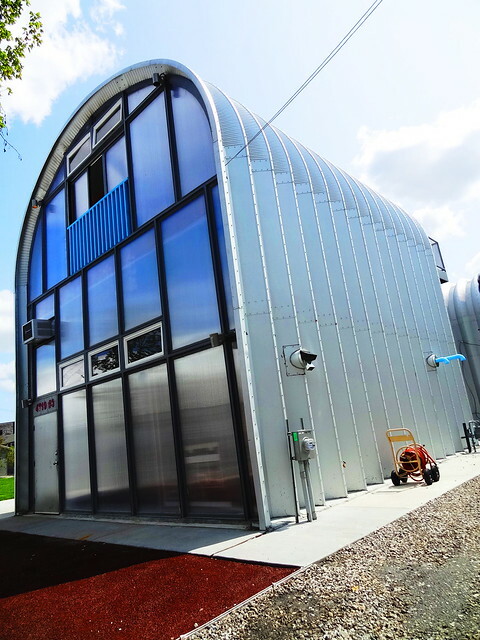 Tucked into a neighborhood near Grand River and 16th Street is a community of Quonset huts called True North. 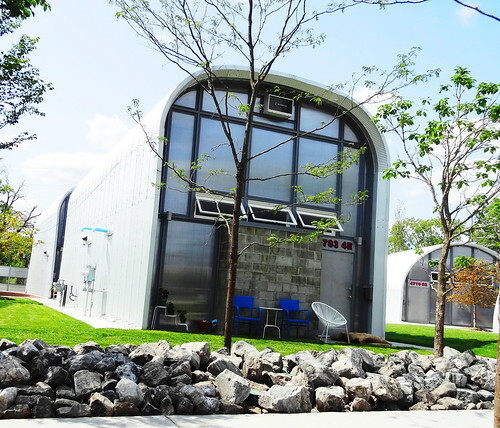 The development features 9 live/work units surrounded by neatly edged lawns, young trees, outdoor gathering spaces and concrete sidewalks that connect building to building. Each unit was designed with a different trade in mind; rent the space, run your business out of it by day, live there full-time. We park on the street then get out to have a look around. 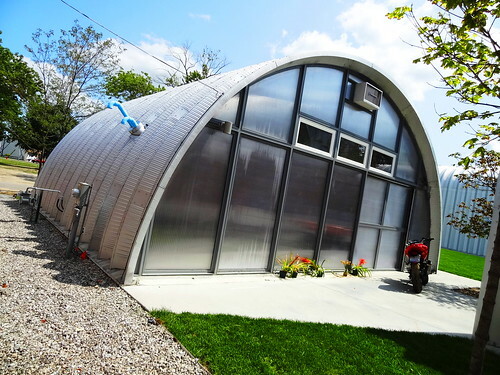 I have to tell you, I really like the way it looks, it’s refreshing to see something different, unique–kind of futuristic… Quonset huts in varying heights and widths, fluted glass, a cinder block back wall, all clustered together to form a neighborhood. Patio chairs and potted plants reside near front doors. Mild temperatures have enticed residents to fully open their doors, we pause long enough to take a peek at each of the interiors; we pass a yoga class in session, I hear the instructor reminding students to breathe. We’re here just before an event is to start, we talk with event planners that live in one of the units, they give us permission to look around. The interiors feel pretty cozy, in winter they are kept warm by radiant in-floor heat, air conditioning units protrude from the upper levels. 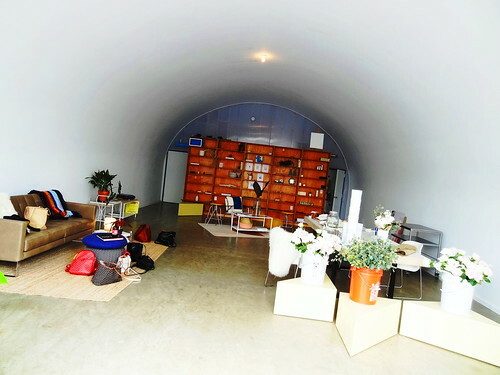 There are 7 full-time residences, 1 gallery space for short-term rental, one studio space and one airbnb. 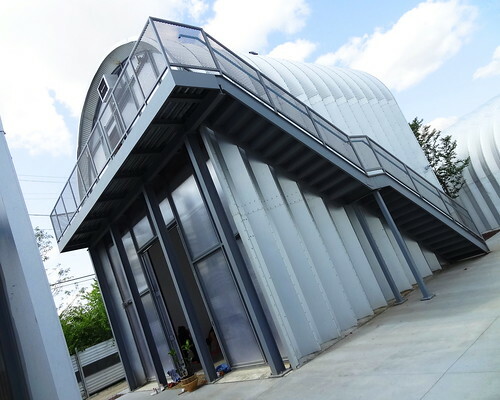 Units vary from 500-1600 sq. ft. True North was the winner of the 2017 Progressive Architecture Award given by Architecture Magazine. This first development is sort of a test to see how it goes, I hope it’s successful and grows. 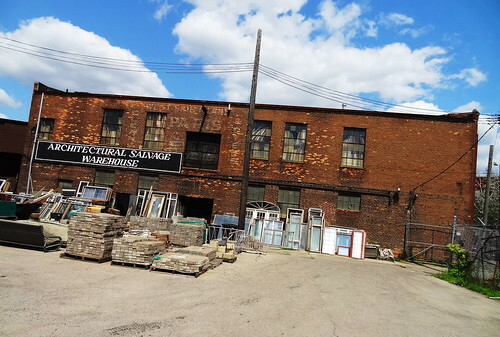 The Architectural Salvage Warehouse is a stone’s throw away. It’s always fun to stop in and see what they have. The gates to the yard are wide open, windows and door frames lean against the brick building. Inside shoppers mill about, I find myself standing in one place, scanning the space from ceiling to floor. Light fixtures are old, new, modern and traditional, prices are fair. 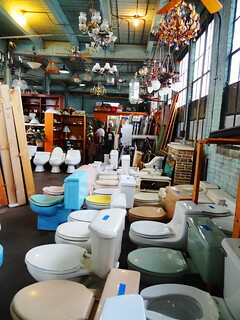 Toilets in an array of colors and shapes take up a large section of floor space. 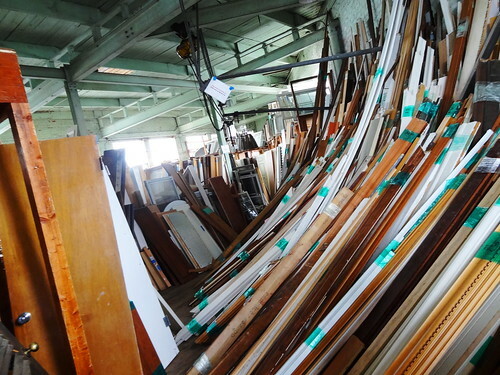 From architectural pieces to decor they have a ton of stuff. Knick Knacks? Yes, they have them, today there’s a nice collection of owls. Register covers are fancy, glass lamp shades and sconces rest in boxes and on shelves. Bricks, wrought iron pieces, glass block and tin ceiling; everything is rescued from buildings before they’re demolished. 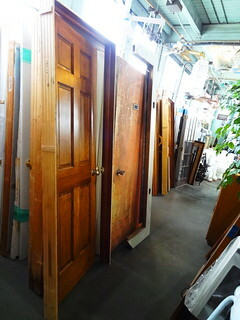 Doors and more doors, wood trim, molding, planks, flooring, wainscoting, railings, banisters and spindles, if you’re restoring a house or just want something vintage, this is the place to come. Let’s move on to another new construction project. 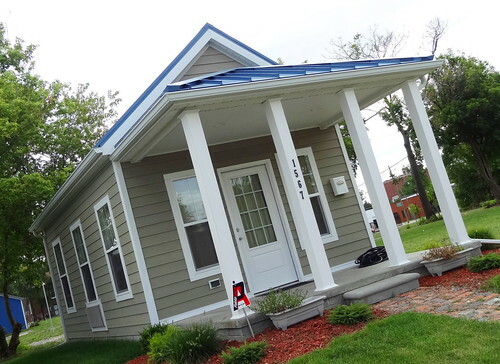 Cass Community Social Services has just built a neighborhood of “tiny homes” on Detroit’s northwest side. 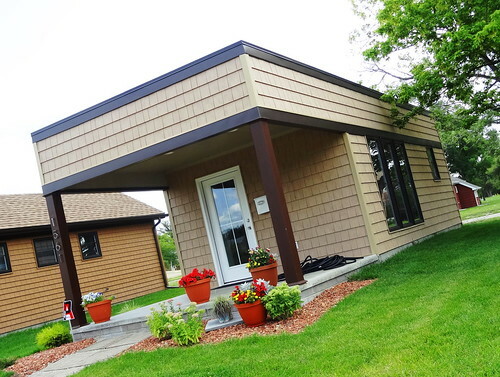 The non-profit bought 25 vacant lots from the city for $15,000, professional tradespeople built the houses, volunteer teams completed the finishing jobs such as drywalling, tiling, painting and gardening. Residents are a combination of senior citizens, college students, formerly homeless people; all of them are working, have a steady income, but qualify as low-income. Get this: Residents pay $1 per sq.ft. 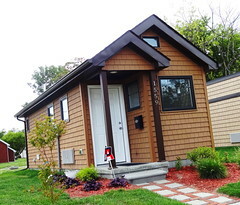 per month, so a 250 sq. 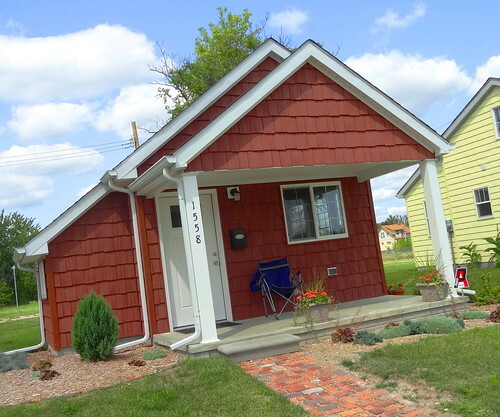 ft. house is $250 a month, after 7 years they own their own home–it’s theirs! They can stay there, or if they wish, they can sell the home, so now if they sell it and get say $40,000 dollars, they will qualify for a loan and have money to put down on a bigger place. This is the only model of its kind in the country, they call it “Rent Then Own” instead of the usual rent-to-own. It’s life-changing. Brilliant isn’t it? We park on Monterey Street between the Lodge Service Drive and Woodrow Wilson, the first thing I notice is each house has its own architectural style, no 2 are the same. One has a blue metal roof, another is sided in wood shingles and has a flat roof. Annuals spill from flower pots, rose bushes are covered in blooms, lawns are freshly mowed. 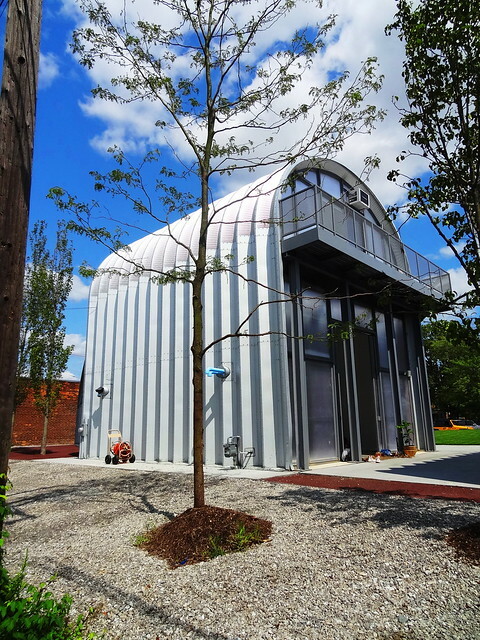 Each home comes with a dishwasher, washer, dryer, stove and refrigerator, some have lofts. 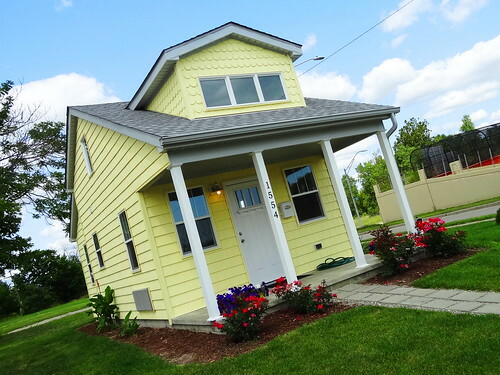 The yellow house has fish-scale siding on the second story–charming. The crisp, white trim on the burgundy house is very attractive. 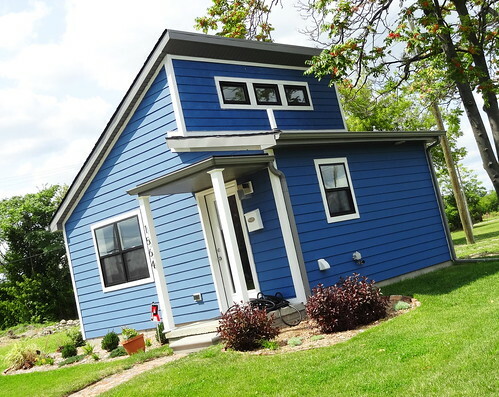 The blue house has a sharply slanted roof, reminding me of mid-century design. 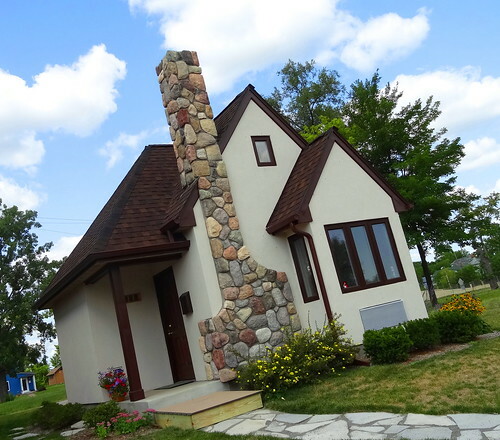 The miniature Tudor was the first house built in the neighborhood, it’s fairy-tale like with the stone chimney and dark wood trim. Each renter must take financial literacy classes, they also have access to mental health, education and nutrition programs. They are learning how to succeed. The neighborhood consists of 7 houses with another 18 on the way. 10 slightly larger versions for families are in the future. What a wonderful way to rebuild a city. Time to eat! 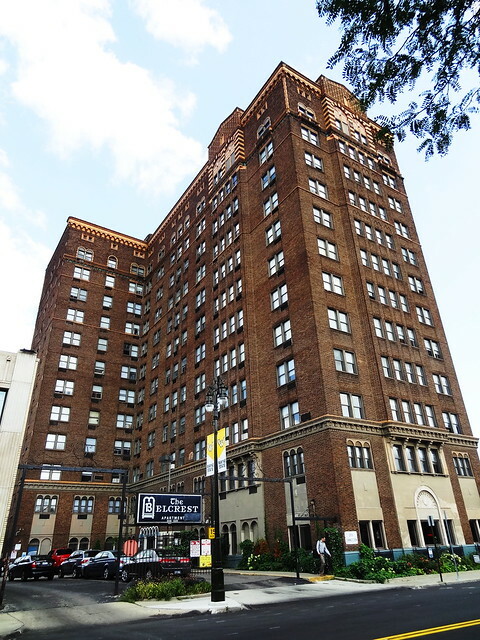 The Common Pub resides on the ground level of the beautiful Belcrest Apartments. Built in 1926 as a luxury hotel, the t-shaped, brick and terracotta building is gorgeous. The original wrought iron entry remains, the interior has been modernized and turned into apartments. It’s a lovely afternoon, was ask to be seated on the patio. 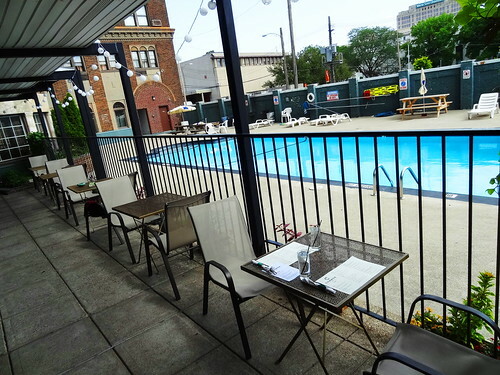 Our table is (kind of) pool-side, a few residents lay in lounge chairs soaking up the sun. The menu has a lot of interesting items, we choose a few to share. While waiting for our food we duck inside an take a look around. Original plaster and opulent moldings remain in some areas. Lunch has arrived; one of today’s specials is the jalapeno corn dog, deep-fried to a golden brown the cornbread coating is crisp on the outside, moist inside and has a little kick. The Beet and Goat Cheese slider is tasty with its basil pesto and arugula. Both of these are served with duck-fat fries–delicious. 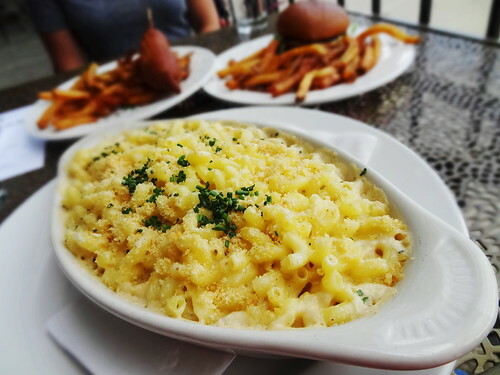 The Mac and Cheese is a generous portion, the noodles are cooked perfectly, the sauce is a combo of white cheddar, manchego and smoked Gouda, we really like it. It’s been another pleasurable day in the city. Old and new are succeeding side by side, the future is looking bright.